These keepsake cufflinks for grooms are customized with a swatch of the bride's gown. 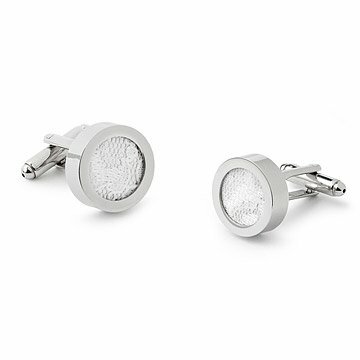 To create these custom cufflinks, Joseph Cirincione preserves swatches of a bride's wedding gown in gold or silver-toned cufflinks, creating one-of-a-kind, coordinated keepsakes for the groom's cuffs. Whether brocade, taffeta, or lace, the fine details of the gown are showcased in the cufflinks' roundel windows, making romantic gifts that add a thoughtful dimension to the couple's big day. If that's not enough to make you well up, the maker was inspired by his own wedding story: Cirincione's grandfather pulled Joseph aside during his own wedding reception and gave him a beautiful pair of antique cufflinks bearing the initials they shared: "JC." Touched by the keepsake, Joseph began creating similarly sentimental cufflinks for other couples to share in the joy that such small details can add to a wedding celebration. Handmade in New Jersey. The best gift EVER for the Groom! Make his day special too! I love finding gifts that are unique and personalized. Uncommongoods is always a great place to find that special gift.